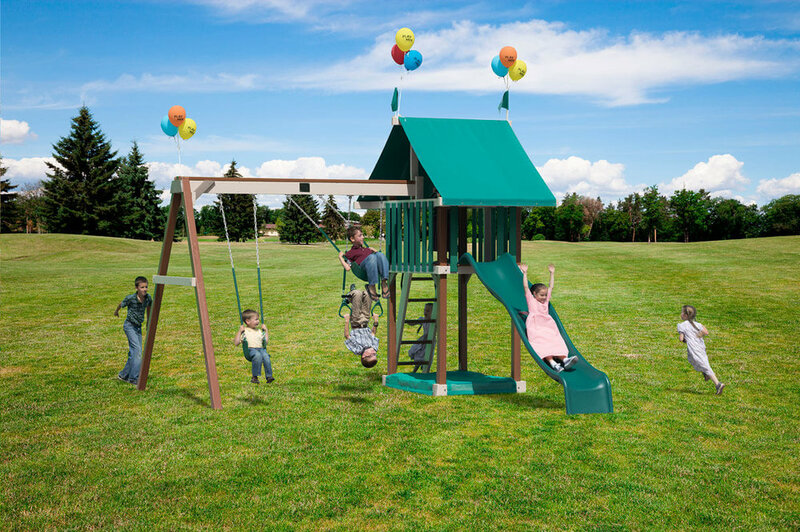 CREATE CHILDHOOD MEMORIES WITH OUR INCREDIBLE PLAY SETS! You can rely on our swing sets to be the safest, strongest and most durable ones on the market. And, we have a variety of play sets to meet a range of budgets and style preferences. We offer three play set lines, each with distinct advantages. Make lasting memories with your children and grandchildren. Let their imaginations run wild while playing on swings, slides, rock climbs, gang planks, monkey bars and towers. There's no better way to get the kids outside for physical activity and a little sunshine. It's just good, old-fashioned fun! Start building your lasting memories now. All our lines are Made in the USA with all domestic wood. Our Play-Mor Polymer play sets will blow your socks off! 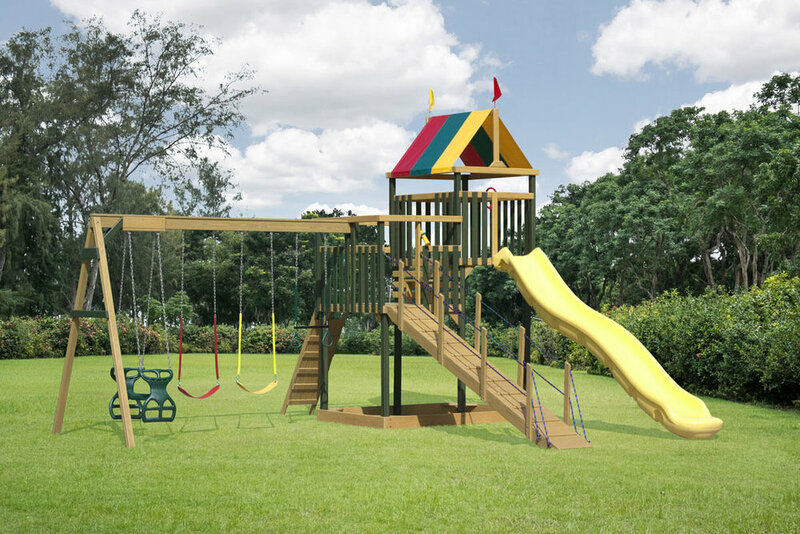 This play set line is the longest lasting, virtually maintenance free play sets at the best prices on the market today. With a revolutionary technology, all wood is treated with a polymer coating. It's not just a covering, the poly coating is literally baked onto wood pieces as a sealer. This means that your play set will remain virtually maintenance free for a lifetime of fun. The Swing Mor Series is our wooden play set line. Made to last for generations, these sets are designed and manufactured with the comfort and safety of your children in mind. We pay attention to detail! All of our lumber is milled and all edges are rounded to keep our product free from sharp corners. Wait until you see the safety chains! You will have the most comfortable grip of any play set out there and it won't chalk up and disintegrate like so many others on the market today. For structural strength, Southern Yellow Pine is used as it has a lasting exterior surface that makes it perfect for creating a sturdy, durable play set. And changing the color of your wooden play set is as easy as adding a fresh coat of paint or stain. Get ready to make some priceless, family memories with these swing sets. The Champ Craft Series is our economy play set line. These play sets in a box comes as shown, without customization. They are also made in the USA with all domestic wood. With the Champ Craft Series, you can get the best of the basics on a budget!